Green walls (also known as plant walls, living walls or vertical gardens) have become a rising new trend of built environments in recent years. Incorporating living nature into urban environments not only looks much more inviting, but also has a number of other benefits and purposes. Whether indoors or outdoors, free-standing or wall-attached, there is a suitable green wall for almost any circumstance. But how exactly are green walls made, and how to differentiate between the various different types? What are the functions and benefits? What types of green walls are there? What do the plants grow in? What plants can be used? Green walls are vertical structures that have different types of plants or other greenery attached to them. The greenery is often planted in a growth medium consisting of soil, stone, or water. Because the walls have living plants in them, they usually feature built-in irrigation systems. Green walls differ from facades, which are often seen climbing up the outside walls of buildings, using them as structural support. In green walls, the growth medium is on the surface or structure of the wall, whereas facades are rooted in the ground. Moreover, the greenery of facades can take a long time to grow enough to cover an entire wall, while green walls may be pre-grown. 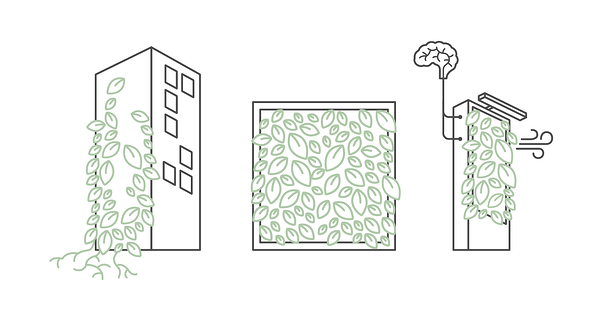 Smart and active green walls often look similar to conventional green walls, but serve more purposes due to the use of artificial intelligence and technology. The features of a smart living wall can be automated and monitored, enhancing the effects. 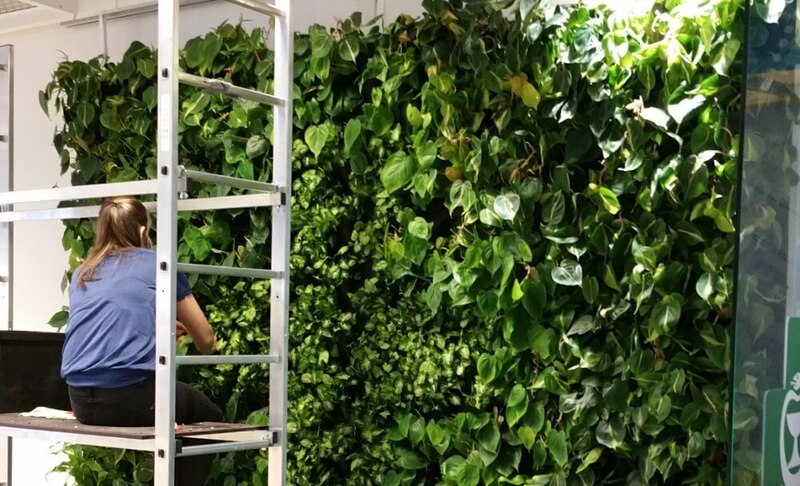 In addition to the visual and biophilic benefits of all green walls, smart and active green walls can feature natural air purification and humidification thanks to the combination of enhanced air circulation, specialized growth medium, and technology. From left to right: green facade, green wall, smart and active green wall. There are many advantages to having green walls livening up a space. First of all, the visual benefits of the living wall cannot be ignored. The eye-catching pieces can make a big impact decorating an urban environment made out of concrete and bricks, thus offering alternatives for urban agriculture, gardening, and indoor decor. 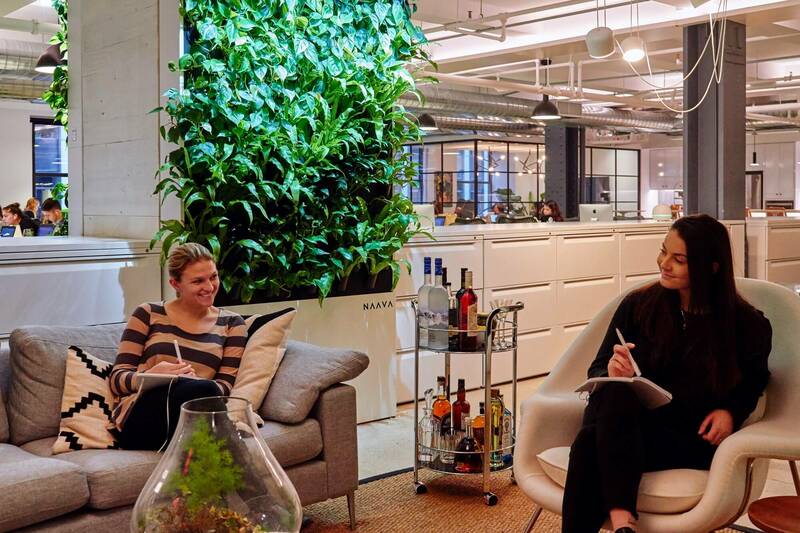 Living walls can make us happier and more productive, as they appeal to our innate need to be around nature. Bringing in natural elements to places where they can’t generally be seen lifts our mood, making us more alert and upbeat. This concept is also known as biophilia. Studies have also shown that nature can decrease negative behaviors, such as aggression and anxiety. Moreover, a connection with nature has been found to reduce stress and mend mental fatigue. This is due to the automatic reaction of our bodies to seeing and being around natural elements. Green elements reduce stress and fatigue. As issues with pollution and air quality have become better understood, plants’ effects on air quality have likewise gathered more interest. The air purification effect of plants is achieved through microbes of plant roots, which can use chemicals as nutrients. Besides direct health impacts, improved air quality has been proven to advance people’s alertness and cognitive abilities. However, regular passive green walls (or plants alone) do not purify and naturalize air effectively enough for a noticeable difference. 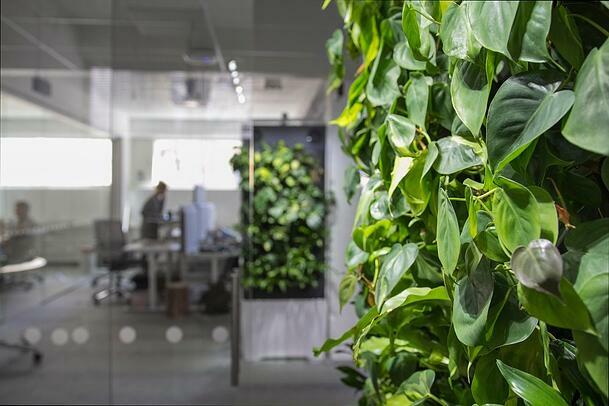 Smart and active green walls with active air circulation achieve this, as the wall, plants, and supporting technology are all designed for the purpose. Outdoor green walls and facades have been found to be energy cost effective as their plants reduce the overall temperatures of buildings when exposed to the sun. Furthermore, they also reduce the amount of heat escaping during wintertime. In addition, the transpiration process of plants can slightly reduce temperatures indoors as well, thus also working as an energy cost effective solution. Sufficient amount of plant matter also helps reduce noise levels. As mentioned above, there are all sorts of green walls. The solutions vary between indoor and outdoor spaces, sizes, and models, among other things. Moreover, the design and production of all types of green walls is constantly developing, providing even more options for various purposes. This article covers what we consider to be the main archetypes. Outdoor and indoor green walls are used for different purposes and in various environments. They can be made of a range of materials and plants, depending on the most suitable solution for each space. Outdoor green walls are primarily visual elements. Although they can also be cost effective in that they reduce overall temperatures, capture rainwater or insulate buildings, they are mostly used to bring greenery into urban landscapes. The construction of these living walls has restrictions in terms of the climate, as they have to endure their surrounding circumstances, which may sometimes take a toll on the structure and plants of the wall. Indoor green walls, however, have more limitations in terms of their size, as they have to fit the space they are in. Because of said limitations, they are often easier to maintain, though. 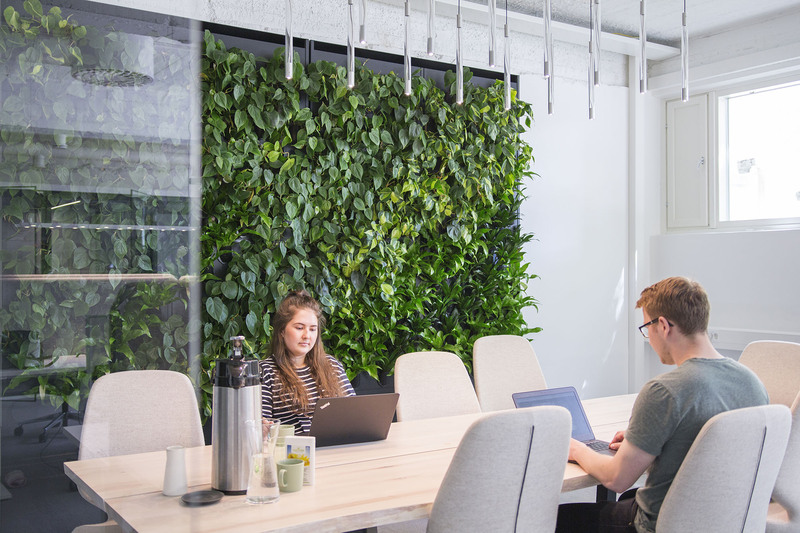 Smart and active green walls are only used indoors because their air purification efficiency would not be powerful enough to impact outdoor spaces. Moreover, the plants used in these green walls are tropical and would not survive in most conditions of the outside world when removed from their natural habitat. A wide living wall at the Ministry of Environment, Finland. The design of a living wall is not usually limited by size. Although wide models are easier to maintain than tall ones, the overall design and manufacturing aren’t too dissimilar between differently proportioned products. Living walls built from metal or plastic modules are usually rectangular, as manufacturing round shapes is harder. Rather, the ideal material for round and varying shapes is felt. In active green walls, air circulation features take priority, thus limiting most designs to solid modules. Most indoor green walls are wall-mounted, although free-standing and double-sided models are not uncommon either. 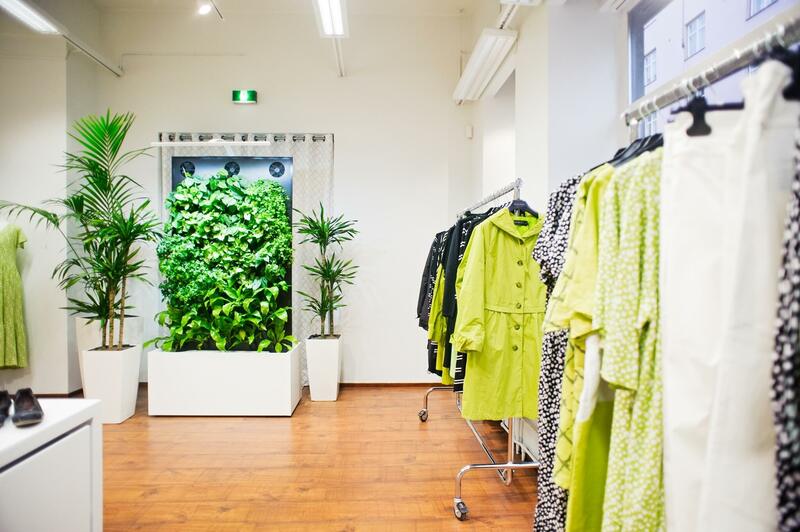 In terms of commercial green walls, most are custom-made solutions. 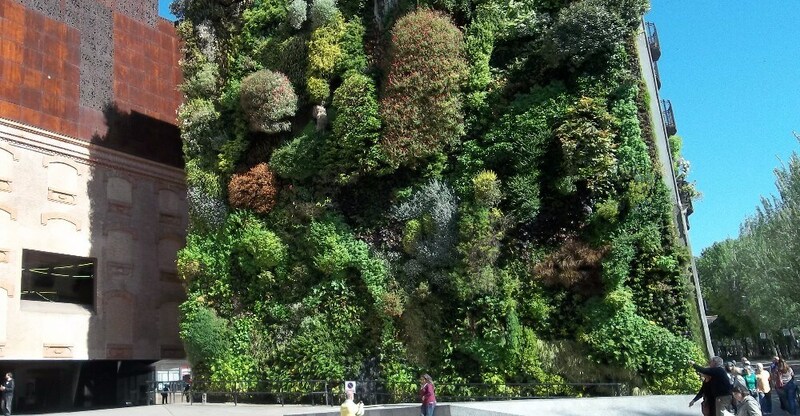 The plants of living walls need a growth medium to root into. The growth medium is usually then placed on a structure (such as bags, pots or boxes), which together form a system. These combinations come in different types, and are generally grouped into four categories: loose, mat, sheet, and structural media systems. Whereas loose growth medium systems have the soil packed into a shelf or a bag (which are then placed onto a wall), mat media are, as the name implies, mat systems, usually made of thin coir fiber or felt. The plants root themselves directly onto the mat and require no loose media (such as soil). Sheet media are akin to mat systems, but consist of patterned inorganic polyurethane sheets more endurant than coir fiber or felt. Structural media combine the loose and mat systems by forming a block that can be made in different shapes and sizes. For example: the greenery can be planted into loose media, placed into pots and laden onto a wall structure with a built-in irrigation. In loose media systems, soil, hydro stone, volcanic stone, and hydroponics are common ways of growing plants. The selection of loose growth media has grown immensely within the past five years. Loose growth media require structural support: soil, stone, and water are typically placed into felt bags or plastic pots. Mats allow the plants to be grown directly into them. Growth media used in conventional green walls tend to be rockwool or soil. These are the most traditionally used materials in the plant industry as hydroponics is considered challenging due to many variables connected to water quality. Most green wall manufacturers use standard growth media available on the markets. 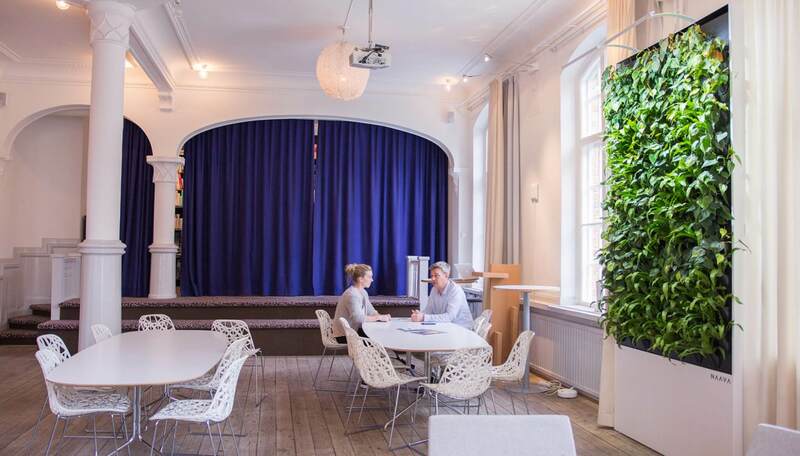 Growth media in active green walls differ from those in regular ones. They require an optimized material to achieve sufficient airflow as well as stable and well functioning microbial communities and water systems. The growth medium, supporting systems and structures, as well as plants have to work in unison. This means that the selection of media cannot be made in vacuum, disconnected from other factors. The stars of the show are the plants. Again, different types of vegetation can be used, however, there are some restrictions depending on the type and purpose of the green wall. Plants for living walls, such as: heartleaf philodendron (philodendron scandens), clusia rosea, and bird’s nest fern (asplenium antiquum). While not a requirement, evergreen plants are usually preferred for both indoor and outdoor walls due to their longevity and looks. By definition, evergreen plants have to keep their leaves all year round. Naturally, this limits the selection of plants available. The most suitable options for indoor green walls are houseplants and tropical plants. Plants generally used for indoor walls do not have to tolerate major temperature changes, though humidity still varies and may cause issues if not accounted for. Heartleaf philodendron, an evergreen plant native to southeastern Brazil. However, some manufacturers resort to using chemically treated moss or plastic plants, which trade other benefits (such as air purification) for easier upkeep. For active green walls the process of selecting the right plant species is even more rigorous than for passive green walls. This is due to the air circulation of the active green wall, which can be quite taxing on the plants. Thus, plants have to be tested in order to make sure they can survive in an active green wall. Location and available technology have a grave impact on the selection of plant species for outdoor green walls. For instance, the walls may require plants which can survive periods of drought due to lack of rainwater and built-in irrigation systems. Outdoor weather circumstances also affect plants indoors, as drier than usual air causes the plants to use more water in order to maintain the optimal level of humidity. In tall facades and outdoor green walls, the wind, sunlight, and rainfall conditions may be rougher on the greenery higher up than closer to the streets. Additionally, the choice of growth medium and irrigation go hand in hand with the selection of plants. For instance, the roots of some plants may not be big and strong enough to thrive in media other than soil. For other plant species, quickly drying growth media are more optimal choices than soil. Moreover, the key to maintaining plants’ health is to create a stable environment for them. Sudden changes may cause the plants unnecessary stress, which may then lead to problems such as diseases or pests. When selecting plants for a smart and active green wall, extra attention is paid to the resilience of the plants. This is because the air circulation of the green wall can be tough on them, as mentioned in the previous section. In addition, each plant’s air purification efficiency is taken into consideration. Different plants break down different chemicals from the air with the microbes of their roots. The right kind of irrigation, regular nourishment, light, and temperature go a long way in making sure the plants stay vital. Maintaining them by trimming also helps to make the plants live longer. Smart and active green walls can also optimize the aforementioned factors to make sure the plants have the best possible living conditions. Maintenance at work. The higher the wall, the trickier it gets to maintain it. 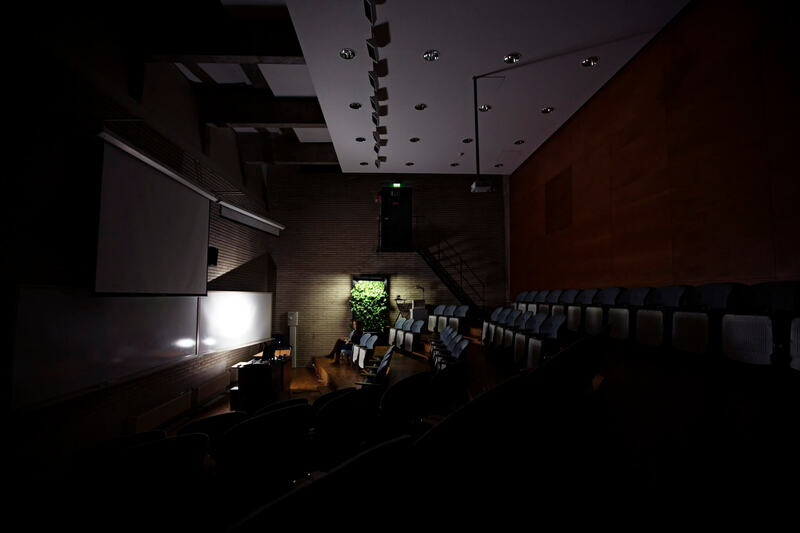 In order to stay healthy to serve their purpose, both green walls and smart and active green walls need upkeep. Like all living plants, greenery in plant walls requires periodical replacements to compensate for plant loss. In loose and structural media solutions, replacing plants is generally straightforward. In mat media systems however, replacing plant matter is more problematic: lost sections often have to be cut off. Removing these sections may cause extra plant loss due to greenery having spread their roots into the removed area. Moreover, water is vital for the survival of the plants, which is why most plant walls have integrated irrigation systems to make it easier to take care of the plants. The plants also need basic nutrients, which are usually received through irrigation. The irrigation systems are typically either recirculating or direct systems. A recirculating system circulates the water, pumping and distributing it from a built-in tank. The tank can be either filled manually or connected to a building’s water supply. Meanwhile, a direct irrigation system gets the water from an external water source. Whereas recirculating systems collect excess water for reuse, direct systems send the excess water to a sewer drain. For a green wall to function as it should, all of its mechanisms need to work properly. In addition to plants, irrigation, and growth media, the remote monitoring systems may also need maintenance at times in case of an error. This is why regular maintenance is needed to make sure everything runs smoothly and effortlessly. As with most things, added features are always tradeoffs. Features, such as the shape, size, and material choices inevitably affect the cost of all green walls. The more complex and customized the product, the more expensive the price tag. The underlying issue is generally not in the design, but rather in logistics and economies of scale. 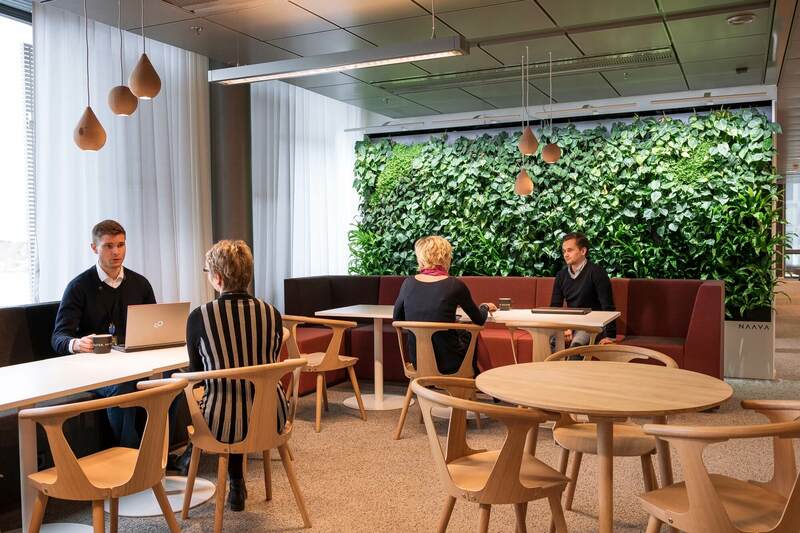 Smart and active green walls are not an exception to the above, but respectively offer greater returns and value over time than mere visual elements. Defining your needs, wishes, and budget is crucial - which solution meets your needs? Something still puzzling you? For more information, questions, or feedback, don't hesitate to send us a message. If you would like to know more, the above benefits, our models, and other relevant information have been summarized into an easily digestible package - the Naava product brochure.